There has been quite a few business articles on GLUE recently, including our MD Ray Mongey discussing what was learned from the New Frontiers Business Development Programme and how it has influenced our business and enabled us to grow. And of course, the LEO (Local Enterprise Office) article on how mentor-ship and initial priming funding can give you the extra push to begin expanding your business. But that’s enough business talk for the minute… let’s have a look at the latest work the GLUE team have worked on! We were commissioned to create the visuals for a LEGO-themed homage to the Eurovision and to wish it a Happy 60th Birthday! In this week’s blog, we would like to take the opportunity to break down some of the shots and explain a little about the process and how this stop motion style 3D animation was created. When the five LEGO Eurovision musical acts were decided upon by our client, we got to work researching. The concept artwork was created based off many days of research on the subject and each act. 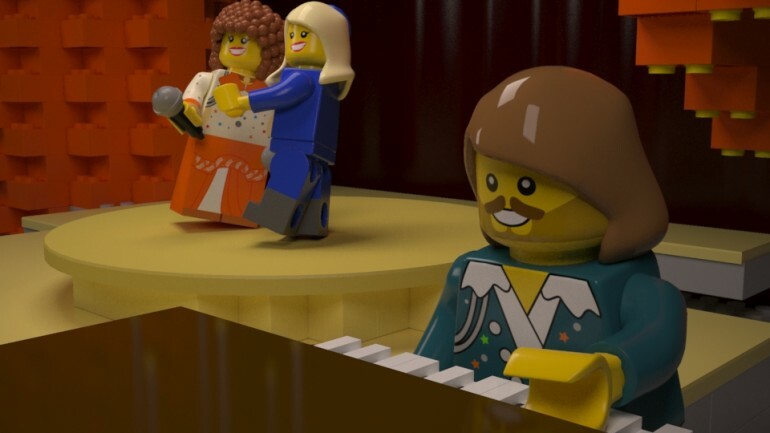 Once we had the base shape of the LEGO Eurovision minifigure, our artists were able to produce different colours and textures to mimic the costumes of the groups. Please see below some of the final concept artwork for the characters. The stages or sets were also broken down to what they would look like if they were made from LEGO. We created individual LEGO blocks of various sizes and literally built the sets as you would in real life. Obviously using 3D software has many advantages, such as duplicating structures you’ve spent time assembling and reusing sections of floor, etc. 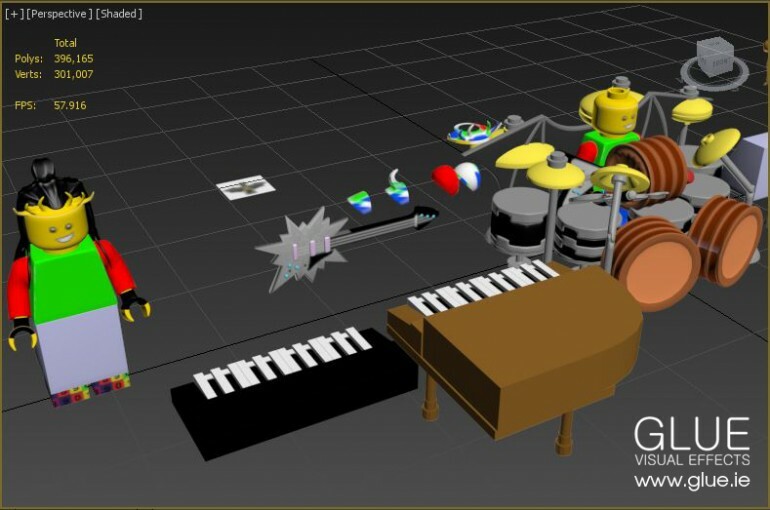 Our talented artists used real-life LEGO toys and individual pieces as references to create the props such as the piano, drum kits, microphone and mic stands and guitars. This attention to detail really makes the final video shine and we’re incredibly proud of our team for going that extra mile! 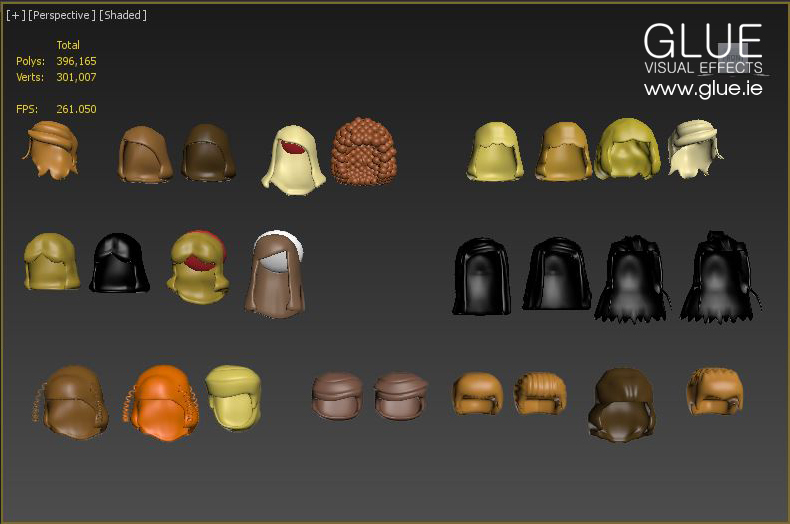 Based on the detailed concept artwork we began generating individual texture maps for each LEGO Eurovision character. The process called UVW unwrapping (nerd talk) basically means our artists take one LEGO Eurovision 3D character and flatten them down into 2D space – think of it as cutting open a cereal box and flattening it on the table. Once we have the flattened version, we can digitally paint all the details and colour onto it – for example a shirt color and tie. Then when reverse the flattening process, the digitally painted shirt color and tie are positioned on the LEGO Eurovisions characters chest as you’d expect. This is a difficult concept to get your head around at first, but once mastered it can lead to some incredibly detailed texturing work. As this was a LEGO animation theme, we needed to recreate the appearance of stop motion. This is the term used when you take a still photograph of, say a LEGO figurine for example, then move their limbs slightly, take another photograph, move them again and so on. When you play this sequence of images back one by one it almost looks like the characters are moving of their own accord. This is the basic concept behind animation too; to produce this stop motion style, our team watched The LEGO Movie around six times, they said it was research! An additional element of the animation was the presenter. She not only had movements similar to the other LEGO Eurovision characters, but she also needed to speak. As the presenter, she introduced the video wishing Eurovision a Happy 60th Birthday from LEGO as well as each individual act. The GLUE team got straight to work working out the most efficient way to make this character talk. This process is called lip-syncing and is used in different ways for every animation where the character or object speaks with their mouth. Our texture artist created different mouth shapes and expressions for the presenter and our animation team begin matching these mouth shapes in time with the voice over audio we were supplied with. The end result is a seamless integration of mouth shapes on the presenter’s face and their animation which brings them to life. We streamlined the animation process by initially creating one finished LEGO Eurovision character with UVWs unwrapped and each individual element named appropriately. This meant our talented animator could begin animating copies of this character immediately while the set building, prop creation and digital texturing process was being handled by other team members. In a digital production environment, this is called the pipeline. Files are fly shared between teams or individuals across our server to each workstation and our management software lets everyone know at what stage the overall project is currently at, in addition to letting the team know when the previous tasks are completed before they can do their work. Another major element in this production was how the final images looked. Our lighting and rendering expert got to work early on for this project and generated a 3D setup which not only looks great, but also significantly reduced the rendering time. Rendering is the process of the computer calculating how the final image looks – thinking about all the textures, the shiny plastic materials and how each light in the scene reflects off the objects and creates shadows. This particular project was a challenge as we’re not just creating little characters dancing about, we’re trying to create the look of these as actual toys moving about using stop motion – not an easy goal to achieve using 3D, but we’re very pleased with the results! On completion of the video, we sent the full HD version to our client. Their client LEGO then uploaded it to their YouTube channel. We are very excited to see the views counting up in their hundreds with every hour it’s up there. To see some of our other interesting projects, click here. To keep up-to-date with all things GLUE, follow us on Twitter or join us on Facebook!